Luminous ECO Watt 900VA Inverter Specs Output Power: 0.9 KVA Voltage: 220 V Technology: Adaptive Battery Charging Control (ABCC) Waveform: Sine Wave Recharge Time: 7 Hrs. Warranty: 1 Year Segments: Home Color: Grey Battery Type: 120AH - 200AH Protection: Ultra-Fast Short Circuit Protection Battery Reverse Polarity Protection The Luminous ECO Watt 900VA Inverter can fulfill the domestic power backup requirements during an electricity power cut. 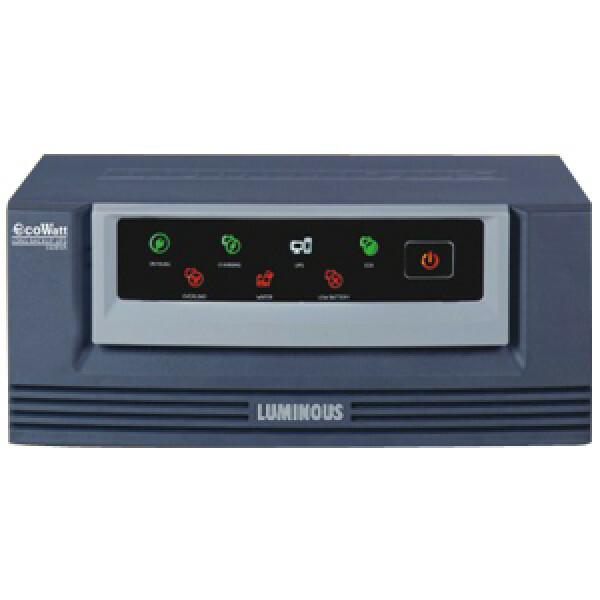 The Luminous ECO Inverter has been designed to bring respite and relief to the Indian families from the often occurring inconvenience frequent load shedding. The Luminous inverter has been designed to deliver smooth performance, offer portability to the user and also be highly space economic. Size and Dimension: The Luminous ECO Watt 900VA Inverter has a very smart and compact design. The designers of the inverter have made it really lightweight and portable which will enable the user to carry the inverter with ease and convenience. It is considered best for domestic use. Technical Features: The Luminous Inverter has been developed on the technology of Adaptive Battery Charging Control also known as ABCC. The Luminous 900VA inverter has a Sine Wave form that ensures that the user gets a top class performance and low of maintenance hassles. The inverter has a stylish grey color external casing that adds to the appeal of the inverter. Application: The Sine Wave Inverter is quite low on its rate of electricity consumption. It requires 110 Voltage for its operation and has an output power of 0.9 KVA. The inverter has a 7 hours recharge time. This Luminous home inverter has a 120AH - 200 AH battery type. It has been provided with attributes that grants the model protection against ultra fast short circuit protection of the battery and also protection against reverse polarity. Noise Level: The Luminous Sine Wave inverter model has a negligible noise level which shall allow the user to have a pleasant ambience at home. Other Features: The home inverter has been provided with a warranty period of two years. This enables the user maintain the inverter in a better manner. The general process of maintenance of the inverter is also quite hassle free. This festive season bring home the Luminous ECO Watt 900VA Inverter to bring continuous light and merry making for your family.